Our friends at Baby Blossom are offering a fun giveaway this week! Following on the heels of owner David’s discussion of double strollers for one of our PwcMoms readers, he’s got a stroller for one lucky reader this week!! Enter below by leaving a comment for your chance to win a Combi Flare!! One entry per person, contest closes on Saturday night, June 30, at midnight. Winner will be announced Sunday evening. The lightweight Flare stroller (only 11 pounds!) with the quick 3-Second Fold, folds easily and compactly and is self-standing. An easily adjustable, reclining seat, footrest and 5-point harness make for a safe and comfortable environment for your child. The adjustable canopy includes a storage pocket. The carrying strap, storage basket, removable padded guardrail, removable child cup holder, and washable seat cushion add convenience. Compatible with the Combi Shuttle 33 infant car seat (not included). 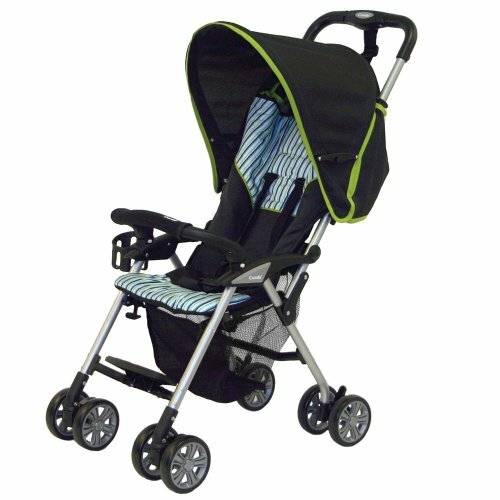 Recommended for children from six months (without use of Combi Shuttle) up to 55 pounds. One entry per person. Baby Blossom is a paid advertiser of PwcMoms.com and is providing one winner with a Combi Flare stroller. Prize listed may not be exchanged or redeemed for cash. Winner must claim prize within 3 days. Winner name will be posted on this page as well as on a congratulatory note on Facebook. Prize is provided by Baby Blossom, winner assumes all liability, PwcMoms is not responsible for any problems, accidents, etc. Please use your stroller responsibly.